Andy Simpkins reviews the oddity that is Status Quo in concert at The Brighton Centre, Friday 28th November 2003. "The Frantic Four...", "The Heads-down, Legs-out Boogie Machine...", "Musical Lamebrains...", "3-chord wonders..."
These are some of the derogatory terms and insults used by the musically constipated and elitist music press that are applied to what is, in essence, something of a British musical institution, but due to the sneering and patronising demeanour displayed by the aforementioned music press, is largely overlooked or dismissed without a second thought by the Great British public. However, this woefully misguided attitude has not prevented Status Quo from notching up record sales in excess of 113 million units, 19 gold discs and a worldwide army of devoted, nay, fanatical, followers in the almost 40 years that they have been together as a band. Starting off in humble surroundings playing in working men's clubs around South East London in the early 60's through a brief flirtation with the Psychedelic music of the late 60's and into the 1970's where they developed their hard-edged 12-bar rock and boogie sound, Status Quo have remained true to their musical roots. I could go into some more of their musical achievements but they have been well-documented elsewhere. During the 90's and into the new millennium, they have showed no signs in slowing down their relentless schedule of touring and album releases for their fans and their last 2 releases:"Heavy Traffic" and "Riffs" just goes to show that there is still a lot of life in the band yet and they will still be touring and recording for the foreseeable future. The Brighton Centre is a modern and well-equipped auditorium seating approximately 6000 people. I arrived and was in my seat just in time to catch the tail end of the support act, a German duo calling themselves 'Who's That Girl?'. who were playing a variety of well-known chart hits from the past 30 years in what could only be described as an idiosyncratic manner, the male guitarist happily plucking away on the strings on his acoustic guitar whilst his female companion strutted around the stage in a rather disturbingly Aryan manner whilst singing the lyrics. They left the stage at the end of their set to a polite ripple of applause but the house lights remained down and a BBC film crew trotted out onto the stage. The reason for their being there was made apparent when a member of the film crew came up to the microphone and stated they were filming a section for Ian Wrights' "I'll Do Anything". Apparently, a lady had written into the show saying that she would do anything to see that her grand-daughter goes on the trip of a lifetime out to Las Vegas in order to see Celine Dion in concert. All very well, you might say, but in order for her to see her wish fulfilled, she had to perform a forfeit. Namely that of going up on stage in front of 6000 rabid Quo fans and miming a series of 'air-guitar' moves to Blur's 'Song No. 2'. Needless to say, she rose to the situation admirably and mimed Chuck Berry's 'Chicken Walk', Pete Townsend smashing up his guitar and Jimi Hendrix plucking the guitar strings with his teeth during his unforgettable rendition of 'The Star-Spangled Banner'. She left the stage to very loud and good-natured applause and the spokesman for the BBC film crew came back on stage to thank us all for our support. After about 10 minutes, the house lights dimmed and a mighty roar erupted from the audience as a mighty, almost sub-sonic bass hum came from the house PA, overlaid by a triumphant fanfare. This is known as 'The Drone' and serves the dual purpose of letting the audience know that the band are about to come on stage as well as heightening the sense of anticipation in the auditorium. The safety curtain dropped to show Francis Rossi;lead guitarist, Rick Parfitt; rhythm guitarist and John 'Rhino' Edwards; bass guitarist, clustered around the drum riser, banging out the opening chords to their ever-green show opener:'Caroline'. The drummer, Matt Letley, promptly tapped out the opening drum sequence and started to lay down the solid 4/4 beat that is a signature of many of their songs. He has only been with the band for 3 years since the departure of their long-time drummer, Jeff Rich, in order to pursue a career in music teaching but he has made a definite impact on the band. He is one of the quietest members of The Quo but with his aggressive drumming style and his trademark headphones that he wears while he is on stage, he has taken on the role as Quo's rhythm machine with gusto. 'Caroline' finished to tumultuous applause and not ones to rest on their laurels, they launched into their definitive Quo song:'4500 Times'. A crowd-pleaser that is always well received and was recently voted the fans all-time favourite song. When that had finished and the cheering had died down, it was down to Francis Rossi, in his role as Quo's front-man to come up to the front of the stage and greet the audience with his usual cocky:"'ow are you then? Alright?!!!'. The crowd responded with their usual roar of approval and the band then continued with a selection of songs from their back catalogue including quick-fire rock classics 'Rain' and 'Mystery Song', both taken from their 1976 offering:'Blue For You'. A rather quirky offering in the form of 'Gerdundula' from one of their earliest LP's. This involved all the band members, including their keyboard player;Andy Bown, who joined the band as a session musician in 1976 and became a full-time member in 1982 with the release of their No. 1 platinum-selling album:'1+9+8+2', coming up to stage front , all clutching 6 and 12-string acoustic guitars and playing a wistful ditty about being overlooked in the minefield that is love. They had a thoroughly enjoyable time playing the song and they all took turns in trying to make each other crack up with laughter and reaching over to pluck at each others guitar strings. The song finished and they took the unprecedented act of bowing to the audience afterwards, something which is rare, to say the least, with today's chart bands. Another favourite song followed in the shape of 'Roll Over, Lay Down'. Another thumping 12-bar triplet blues classic. Back to business, as the saying goes. The Quo followed up with a quartet of songs from their 2002 release:'Heavy Traffic'; their best-selling CD of the past 5 years. The songs they played were :' Creepin' up on you', a 12-bar triplet blues number that has the crowd clapping in time. 'Solid Gold' which has keyboard player Andy Bown honking away on a harmonica in the best Blues tradition; 'All Stand Up', an energetic boogie number and 'The Oriental';a very tongue-in-cheek song dealing with the subject of mail-order brides from the Far East quickly followed by a cover version of the Chuck Berry favourite:'Carol'. Status Quo always have a number of favourites that they play whenever they go on tour and they never fail to include these. 'Burning Bridges' always has the South Balcony of the Brighton Centre groaning alarmingly as all the fans jump up and down in time to the music. 'Down, Down' is another perennial favourite and one song that hasn't been heard live for quite a few years is 'Living On An Island';an acoustic-based song that Rick Parfitt wrote when he and other members of the band were living in tax-exile in the latter half of the 1970's. Another favourite that they played was one of their earlier compositions called 'Most Of The Time. 'Status Quo songs and concerts involve a fair degree of audience participation and during the playing of this song, it was no exception. When Francis Rossi sang the lines :...may I be wiser, may I be younger...', the audience shouted back with a very loud and very good-humoured:"NO!!" that has Francis Rossi snickering into the microphone every time. The house lights came up as the band waved the audience a fond, if temporary farewell. The crowd stomped and shouted their approval and a few minutes later, after a well-deserved quick rub-down with a towel and cigarette-break, the band re-appeared on stage for their encore. This comprised of more crowd pleasers including 'Whatever You Want'. Unless you have been living under a stone for the past 30 odd years, this song is immediately recognisable to both Quo fans and non-fans alike and a few years ago, was even allowed to be used in a TV advertisement for the chain store, Argos. This was followed up by THE all-time recognisable Status Quo song of all time:'Rockin' All Over The World'. Few people would actually have the nerve to say that this song was originally written by John Fogerty of the 70's band, Creedence Clearwater Revival. Status Quo have effectively taken the song as their own and it is almost universally recognised as such. Their final song was a sprawling version of 'Bye Bye, Johnny' by Chuck Berry and during the course of the song, Francis Rossi managed to improvise with a few guitar frills of his own amongst other things. As a final note, I can only say this:I saw Status Quo for the first time in 1984 when I was a spotty-faced, long-haired 19 year old teenager up at Crystal Palace's football ground, Selhurst Park in South London. 22 concerts later, a variety of venues including Wembley Arena, Brighton and the stately surroundings of Petworth House in the heart of the Sussex countryside. 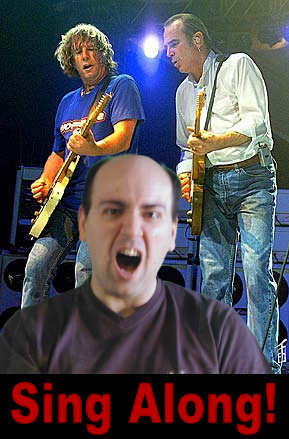 Almost 20 years later, I am without the teenage acne, a lot of my hair is now a distant memory and I am almost at the Big 4-0 age-wise but I still go and see The Quo at least twice a year and thoroughly enjoy it. In a day and age where a lot of music in the charts is manufactured and instantly disposable and forgettable, Status Quo stands for something that is unchangeable and immutable in the face of pop music's comings and goings.